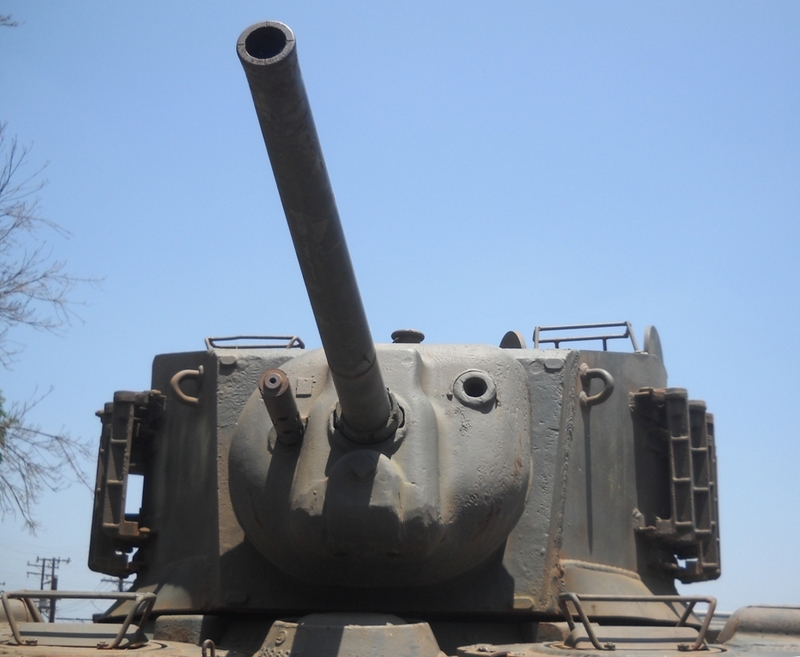 M5 tank: My sister Anne Edwards said this picture reminded her "of Pinocchio." Because they are veterans, my father and brother are eligible for a reduced entrance fee at the tank museum near Los Angeles. They saved $1 off the low $5 entry fee. Their service struck me as a very hard way to save a buck. 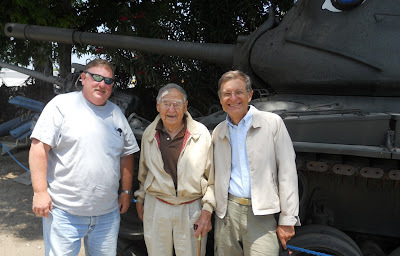 My dad, Lefty, brother Phil and brother-in-law Andy Krone visited the American Military Museum, as it's called, on Father's Day weekend. We realized on the way to the museum that we didn't know the address (1918 Rosemead Ave., South El Monte, Calif., phone 626-442-1776). We'd nearly passed it when Andy noticed that the large field to the left was filled to overflowing with military vehicles, including a Huey helicopter. "That could be it," he theorized. And, sure enough, it was. Andy, Lefty and me found parking next to a M60 tank. The museum claims it has 178 vehicles and guns on exhibit and that sounds right. Every exhibit is numbered and visitors are issued a three-ring binder with a paragraph on each to carry around. Unfortunately, the binder stays at the museum when you leave, so I don't have exact captions for most of these pictures. 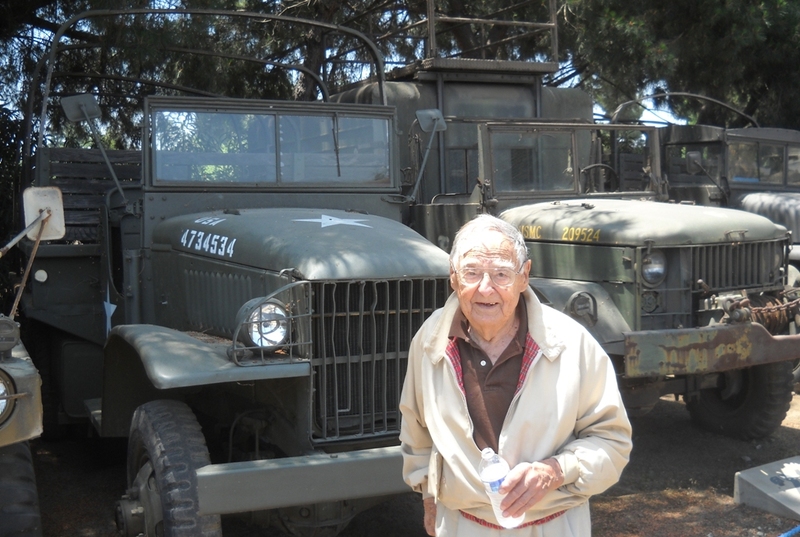 Lefty remembered the World War II trucks like this one. Reading the binder was great, but it was more fun to listen to our two vets and others inside the museum describe personal experiences. Lefty remembered that World War II drivers sometimes maneuvered 6-by-6 trucks so close that they knocked off the distinctive bows holding up the canvas in the rear. Mirrors went, too. "That one I could start," my brother said, nodding to a M60 tank — except, of course, the batteries would be dead. "They always were." 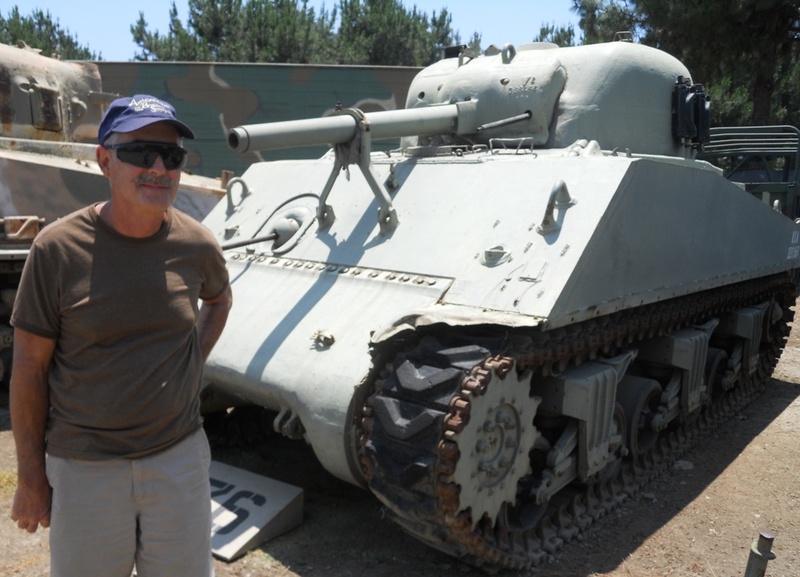 Phil with one of the many Sherman tank variants on display. A few of the vehicles on display have had appearances in movies. A M5 tank played its role in "The Wind Talkers" with the help of two modern Chevrolet engines and automatic transmissions. 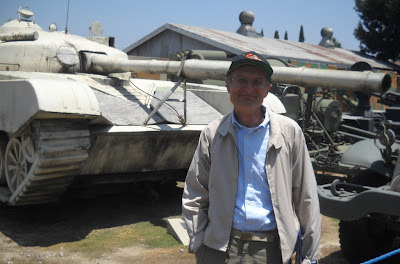 Some of the Soviet-era gear on display was captured in Iraq, but one hulking Commie "tank" turns out to have been built in America: it's a convincing fiberglass mock-up riding around on the chassis of a Chevy van. Realistic Soviet-era tank is a phony riding on a Chevy van chassis. It was used to help develop U.S. anti-tank missiles. They all must have missed, because this is van conversion looked to me like the perfect vehicle for LA freeways. 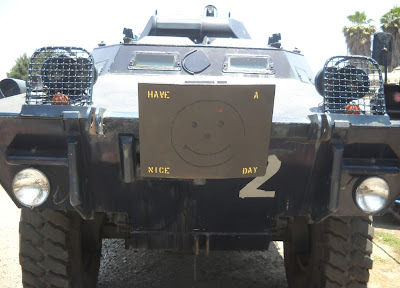 Armored car adopts a friendly attitude: "Have a Nice Day."